I was the kid at camp who avoided arts and crafts like it was the plague. Fear gripped me when it was time for art class in school. I’m the type of person who cannot draw a straight line with a ruler…invariably my finger hangs over the ruler edge and I end up with a slight bump in the line as I trace around my fingertip. So it follows that any clay project I attempted as a student blew up in the kiln. Every. Single. One. Lucky for me I am able to look at different forms of art and appreciate them. I love looking at pottery and am amazed what folks are able to do with a lump of clay. There may be a time in my future when I take pottery lessons but, for now, I’m still sufficiently traumatized by past history. Let me tell you a little about Albany Slip as I understand it. It is a clay discovered in the Albany, NY area early in the 19th century. This area is rich in glacial deposits because much of it was carved out by glaciers and their subsequent retreat. The glaciers also created many of the lakes in this area…hint, hint. Albany Slip is high in iron which allows it to have a rich, dark brown color. When used as a glaze in the interior of vessels, it creates a surface similar to glass and renders the vessel impermeable. Part of the reason I chose to use it in my novel is that it fits with the idea of a quarry and rocks. Most of the reason is I think it looks terrific, a true old-school pottery look. 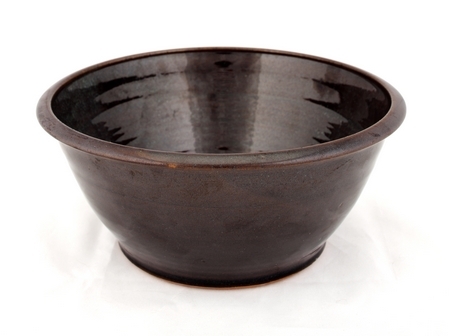 Looking at this bowl, one can see the beauty of the inside glossiness and the earthy look fo the exterior. I hope you look forward to reading the book to see how it’s incorporated into the story and to learn more about it. This entry was posted in mystery, pottery, settings, Uncategorized, writing and tagged mystery. Bookmark the permalink.